The Anchor & Hope is an award-winning gastro pub near London Waterloo train station and close to the Old Vic and New Vic theatres and, despite being in business over a decade, this website is their first ever web presence. The brief was to create a simple design framework that could be re-purposed by the pub’s sister venues, including Great Queen Street Restaurant and The Magdalen Arms. The ability to publish daily menus with ease was the other key requirement. The websites are fully responsive, working across devices from smartphones to desktop computers. 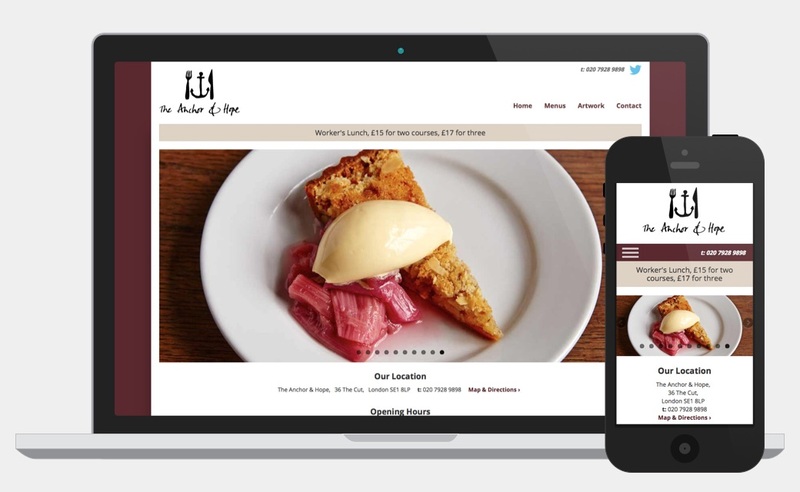 We felt the need for a responsive design was essential having studied the analytics of the website for Le Café Anglais where mobile usage was over 20%. Perhaps more importantly this informed critical decisions regarding the user interface – if so many users were likely to use a smart phone to access the site, they would be unlikely to want to navigate multiple pages to reach key information like contact details and opening times. With that in mind, we put opening times and contact details on the homepage and the contact telephone number is prominently positioned in the header throughout the site. It was agreed that the homepage should have strong visual impact by utilising the greatest asset of all 3 venues: their food. With that in mind the photographer Patricia Niven was commissioned to photograph some of the wonderful menu items to appear on a homepage image scroller. Staff are able to update daily menus using the Ehaus content management system by simply copying and pasting the text from the Word documents they use to print menus in-house.